Mike Taylor is back again, to take a look at the extremely versatile and highly acclaimed KD3000 Series Primers and the coveted Super Silver Sealer. Gain some knowledge on how these products work and what sets them apart from the rest. KD3000 Series Primer/Sealer - KD3000 is a hybrid epoxy two component primer designed to be used as a DTS or Direct to Substrate High Build High Build Surface r, Medium Build Surfacer/High Build Sealer, or silky smooth sealer. Available in 6 premixed colors which can be intermixed for a wide range of colors. KD3000 is an industry first and undisputedly the best foundation system available. KD3000 has excellent adhesion, corrosion resistance, productive dry times, and ease of sanding. These DTS surfacer/sealers emit very low amounts of Volatile Organic Compounds (VOCs), Hazardous Air Polluting Solvents (HAPS), and contain no isocyanates. The KD3000 Series DTS surfacer/ sealers may be applied to the existing OEM finish, bare steel, aluminum, fiberglass, galvanized surfaces, and various plastics. Its tenacious adhesion, hi-build, excellent durability, and water and corrosion resistance and ease of sanding makes it a superior choice for the basis of a long lasting custom paint job. 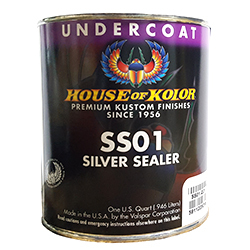 Super Silver Sealer - House of Kolor Silver Sealer is the only silver sealer in the automotive paint business. Considered a must under all metallic based colors for easy to spray even coverage of metallic basecoats. Fewer topcoats will be necessary for additional savings. SS01 is a premium polyurethane catalyzed sealer system providing tenacious adhesion and long term color hold out. 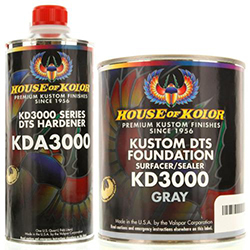 Engineered to work over House of Kolor’s new KD3000 Direct to Surface colored primer system, KP, KS, KD systems, and OE finishes. SS01 can also be custom tinted with up to 10% of Kandy Koncentrate for an even closer color match under Shimrin2® and original Shimrin® basecoats and Kandy basecoats.